In recent days, the winds have shifted providing ideal conditions to assist Pink-footed Geese with their autumn migration from Iceland. Before long, that all too familiar sight and sound will start to fill wetlands, estuaries and mosses as the geese arrive back to Britain, heralding the approach of the first Icelandic-breeding Goose Census count of the 2017/18 season. However, before the counting begins, let’s take a look back on the results from 2016. Autumn 2016 proved to be another year of high Pink-footed Goose numbers, albeit not quite as high as the peak recorded in 2015 (536,871). Nonetheless, a total of 481,341 Pinkfeet was counted during the mid-October count, representing the second highest total in the 57 year history of the census. The largest counts came from Montrose Basin, where over 90,000 Pink-footed Geese were recorded on 18 October and 42,840 on the 23rd (the weekend of the coordinated count). At other sites in Scotland, a count of 34,340 was made at Loch of Skene on 22 October, while 30,300 were recorded at the Beauly Firth on the same day. Earlier in the month (4th), a count of 31,000 geese was reported for Loch of Strathbeg. In Lancashire, 30,050 Pinkfeet were counted at WWT Martin Mere on 23rd, whilst on the same day, a count of 23,893 was recorded at the Alt Estuary, the largest count ever reported for this site. The November 2016 count produced the latest Icelandic Greylag Goose population estimate, with a total of 90,471 geese being counted. This represents a 5.2% drop in numbers compared with the previous year. An estimated 50,000 Greylag Geese remained in Iceland at the time of the count, whilst 46,678 geese were located in Orkney, though c. 21,000 of these are thought to be non-migratory British birds. With the majority of the Icelandic Greylag Goose population now located in Orkney, numbers elsewhere in Britain are much lower, with the count of 5,274 at Loch Eye being the highest during the 2016 count. And so, with another season of counting just around the corner, IGC counters are gearing up to take us into the 58th consecutive year of monitoring these wonderful migratory geese. Providing these vitally important annual population estimates of Pink-footed and Icelandic Greylag Geese would not be possible without the support of a large number of dedicated goose enthusiasts. An enormous thanks go to all IGC counters and regional coordinators for all their hard work and support for the census. 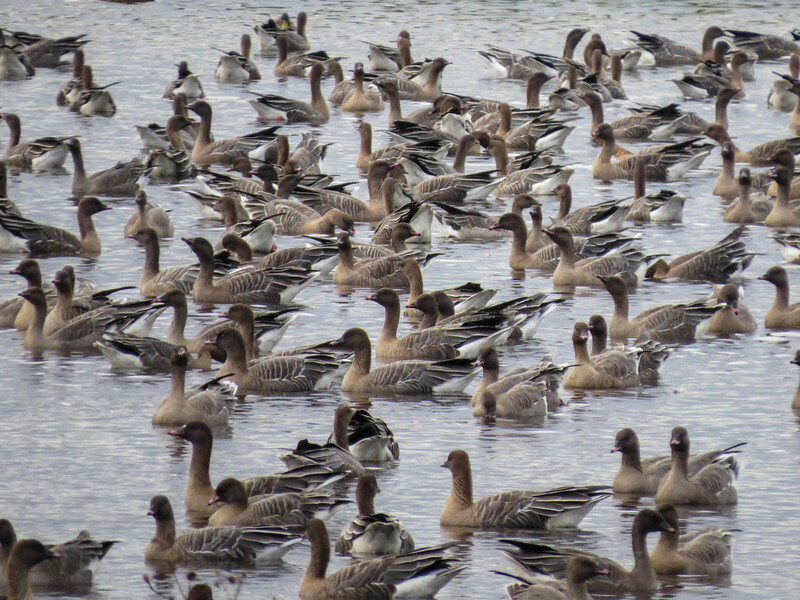 Large counts of geese must provide many counters with some spectacular scenes and wonderful connections to nature. If anyone would like to share their stories of goose counting, please do get in touch and we would be happy to post it either on our website or perhaps in the annual newsletter GooseNews. The latest edition of the IGC report can be downloaded from here and remember to keep an eye out for our recently colour-marked individuals.